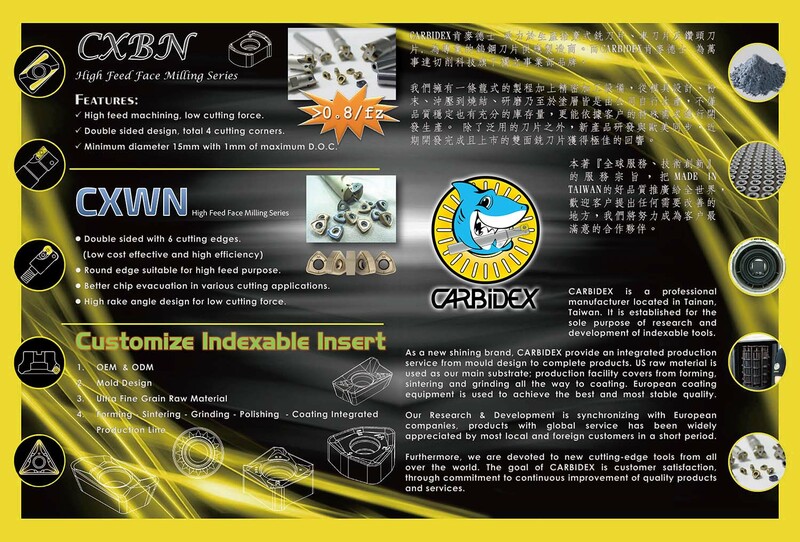 CARBIDEX was launched on July 2014 as a standalone business division under the company of Winstar Cutting Technologies, for the sole purpose of research and development of indexable tools. As a new shining brand, CARBIDEX provide an integrated production service from mould design to complete products. US raw material is used as our main substrate; production facility covers from forming, sintering and grinding all the way to coating. European coating equipment is used to achieve the best and most stable quality. Our Research & Development is synchronizing with European companies, products with global service has been widely appreciated by most local and foreign customers in a short period. Furthermore, we are devoted to new cutting-edge tools from all over the world. The goal of CARBIDEX is customer satisfaction, through commitment to continuous improvement of quality products and services.